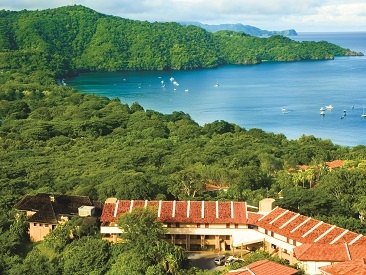 Villas Sol Hotel and Beach Resort is an all-inclusive, family-friendly hotel, located in Playa Hermosa, Guanacaste on the Pacific coast of Costa Rica. This resort is nestled along a lush, tropical hillside and presents phenomenal views of the ocean. Charmingly decorated guestrooms and villas have a private terrace, a plunge pool and unbeatable amenities. At the beach or pool, family-oriented fun is always at hand; enjoy games, water sports, delicious cuisine, a full-service spa and fitness center, a hot nightclub plus thrilling tours and excursions that are fun for the whole family. Whether seeking an action-packed adventure, a rejuvenating retreat or a romantic escape, families, couples and friends will love the Villas Sol Hotel and Beach Resort. 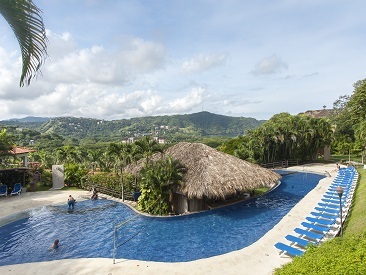 The lovely all-inclusive Villas Sol Hotel and Beach Resort is located in Playa Hermosa, Guanacaste on the Pacific coast of Costa Rica and is nestled along a lush tropical hillside presenting phenomenal views of the ocean. Charmingly decorated guestrooms and one, two, and three bedroom villas, have a private terrace, and some villas feature a plunge pool. There is plenty of activity to fill your days at the Villas Sol. At the beach or pool, family-oriented fun is always at hand. Enjoy games, water sports, delicious cuisine, a full-service spa and fitness center, a hot nightclub, and thrilling tours and excursions. Whether seeking an action-packed adventure, a rejuvenating retreat, a romantic escape or something in between, families, couples and friends will love the Villas Sol Hotel and Beach Resort. Villas Sol is 4 hours from the Juan Santamaria International Airport (SJO) in San Jose and 25 minutes from the Daniel Oduber International Airport (LIR) in Liberia, Guanacaste. Family-friendly, but also perfect for couples, the atmosphere is comfortable, relaxed and intimate. Be as active as you want with water sports, workouts, and eco-adventures, or relax at the pool, the beach or spend a day at the spa. Supervised activities for the kids will fill their days with fun and excitement. Everyone will enjoy wonderful dining and nightly entertainment. A group of select partner hotels offering year-round children's specials and other exclusive family travel extras. The exotic gray-sand beach of Playa Hermosa received the 'Blue Flag' award by the Costa Rican Institute of Tourism due to its cleanliness, quality and due to the conservation of its natural resources as set forth by the community of Playa Hermosa. Additionally, this beach is also renowned as one of Costa Rica's best places for skimboarding, diving, kite surfing and snorkeling. A shuttle service runs frequently from the hillside resort down to the beach or guests may walk the short distance down the hill. 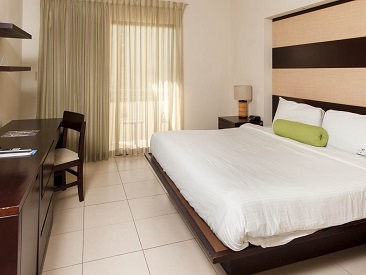 This great deal may land you in either the Deluxe Room of SuperSaver Studio at Villas Sol. By booking the Mystery Room deal, you understand you are not guaranteed requests. There are no hotel updates at this time.